Bleach does not actually stain fabric if accidentally spilled, it takes the color out. 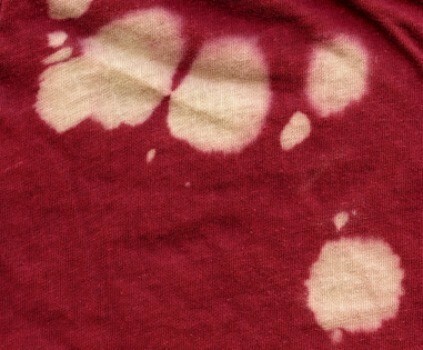 This is a guide about dyeing fabric to cover a bleach stain. How do I get a stain or a bleach stain out of black scrubs with Rit liquid dye? Believe it or not dying may not be your best choice. Often bleach changes the dye-receptive qualities of the fiber (it may take but not stay), and if the garment is a cotton-synthetic blend the dye will not take at full color strength. Your easiest fix is...are you ready? A Sharpie marker! You may have to redo it every so often, but it typically lasts through several launderings. Just dab the Sharpie on the bleach spots close together until the spot blends in with the garment. I say dab it on because it will push the ink further into the fibers than just coloring over the spots, for more and longer lasting coverage. My favorite pair of khaki pants have a bleached looking spot. I'm guessing I leaned on the edge of the sink where one of my daughters had dropped a little Oxy 10. I figured I should take the color out and try RIT tan dye. I tried RIT color remover, and it did not work. I didn't use hot water. Is that the key? Can I use bleach or peroxide instead? If the Rit dye remover did nothing, and it is just a little spot, I'd try a little spot repair - like colouring it with Jiffy permanent marker in a similar colour. Or maybe if it would work, sewing a decorative patch over the spot. I would not do a major dye job for just one little spot. Too much room for disaster. How can I re-dye a sweater made of cotton and alogon? It is light pink and I want to dye it dark pink. It was stained by bleach.